The Uber IPO will be one of the most hyped initial public offerings in history when the ride-hailing company comes to market – which could be this year. No Uber IPO date has been set, but it's just a matter of time before the company goes public with the rate it's growing. A $1.2 billion round of funding in December valued Uber at more than $41 billion. It operates in more than 250 cities across 55 countries. With that most recent funding round, Uber has now raised eight times as much capital as its closest competitor, Lyft Inc.
That valuation would make Uber bigger than Twitter Inc. (Nasdaq: TWTR) and its $31 billion market cap. "At this valuation, investors appear to be thinking that when Uber goes public, it might be worth $80 billion to $100 billion," CB Insights' Chief Executive Officer Anand Sanwal told Bloomberg. "This type of mega-financing affords Uber a great deal of flexibility in terms of when they might go public." But before an Uber IPO happens, the company has some major issues it must fix. There's a growing list of cities and countries that have either banned Uber or suspended its services. 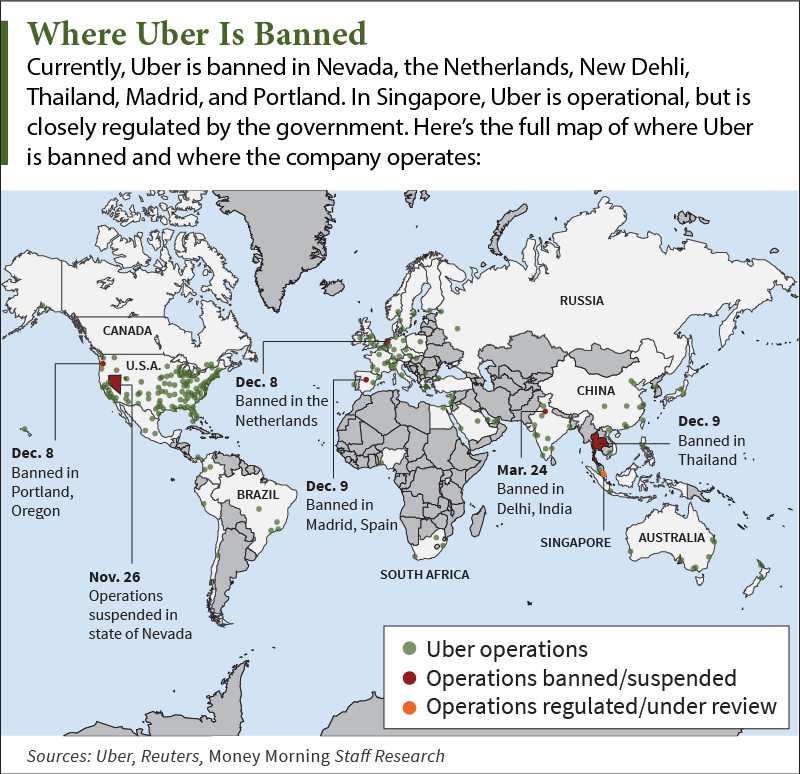 This map indicates where Uber is banned as of March 24. Competitors see the company's business model as too disruptive to traditional taxi services. The taxi industries and legislators in various cities around the world have also taken exception to Uber's practices. In many countries, Uber does not meet the necessary licensing and safety requirements. On March 24, New Delhi, India, courts upheld a ruling banning all Uber operations. The operations were originally suspended in December after a passenger reported being raped by a driver. In early December, Uber was banned in the Netherlands when a Dutch court ruled the company breaks local taxi laws. The court also ruled that Uber does not meet the country's licensing, insurance, or safety regulations designed for the taxi industry. Uber has been appealing the ruling. According to the company, many of the laws regulating international taxi industries are outdated. "The law is out of date and that means the technological service we offer had not yet been invented," Uber spokesman Thomas van Oortmerssen told Reuters at the time. "The law needs to be changed to make it possible and it is now up to the politicians to do that." A similar ruling occurred in Thailand in December. Aside from licensing issues, Thai officials took exception with Uber's payment service. The state of Nevada suspended Uber operations claiming the company was disregarding the state's law on carrying passengers. A judge in Madrid, Spain, declared Uber unlawful in the city on Dec. 9, saying Uber drivers are unregistered and pose unfair competition to taxis. Uber is also facing suspension in Portland, Ore., although the decision is still pending trial. The city says Uber is operating an "illegal, unregulated transportation service." Portland officials claim Uber operates without the correct company permit and without a vehicle permit. Finally, Uber operates under close regulation in Singapore. There, fees charged to users cannot exceed what a government regulated taxi would charge. The Bottom Line: Investors will be wary of an Uber IPO that happens before these issues are ironed out. It's always best to be on more solid global footing before asking for more money.